When Keith Swankie experienced shooting pains in his right arm and stiffness in his right leg in 2008, little did he know he was in the early stages of the neurological condition PSP (Progressive Supranuclear Palsy). Tests showed up nothing and the symptoms disappeared, so Keith continued living his life as normal. Then in 2009 he fell backwards in his living room and began suffering pains and rigidity in his legs and arms. He was referred back to a Neurologist and as his symptoms worsened with weakness in his arms and legs he was tested for Multiple Sclerosis, but the tests were clear. After further tests and visits to different specialists he was eventually diagnosed with a functional illness and told nothing more could be done. Keith’s symptoms continued to get worse. His right eye was closing involuntarily and he was unable to walk without an aid. He then began suffering hallucinations, constipation, inability to mobilise his limbs and tremors in his arms and legs. He also experienced facial spasms and began falling backwards regularly. Keith’s GP Dr Giles Ledlie was at a loss until, by chance, he attended a conference led by a Geriatrician with a special interest in Parkinson’s Disease and PSP. “I had never seen a case of PSP before,” said Dr Ledlie, a GP in Angus, Scotland. 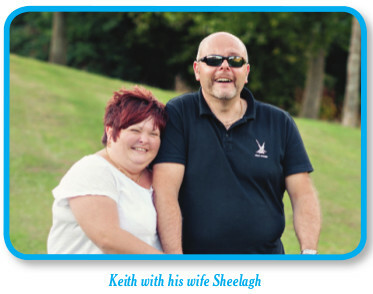 “But the more the Geriatrician spoke about the symptoms the more I kept thinking of Keith. I spoke to the Geriatrician afterwards and he suggested I refer Keith to his clinic.”Keith was eventually given a diagnosis of PSP, complicated by other symptoms. He is now reviewed regularly by a specialist Parkinson’s team. PSP and the related condition CBD (Cortiso Basal Degeneration) are rapidly progressing neurological conditions caused by the death of nerve cells in the brain, which affect eye movement, balance, mobility, speech and swallowing. Over time they can rob people of the ability to walk, talk, feed themselves and communicate effectively. The average life expectancy is seven years from the onset of symptoms. The prevalence of PSP is 6.4:100,000 but it is thought the reality could be as high as 15:100,000. • Cognitive difficulties, such as changes in mood or behaviour, including apathy and anxiety. “A diagnosis of PSP is an opinion from someone with experience,” said Dr Ledlie. “PSP isn’t something that you can test for and that’s what makes it more difficult to diagnose. But GPs have to be aware that there is something wrong and make sure they refer to the appropriate specialist. “I would say to any GP, if you suspect a movement disorder refer the patient to who ever in your area deals with movement disorders, rather than a general neurological clinic to ensure a better chance of diagnosis,” he added. The PSP Association is a national charity which offers advice, support and information to people living with PSP and CBD, and supports research into the conditions. The charity operates a helpline for people affected by PSP/CBD and healthcare professionals on 0300 0110 122. 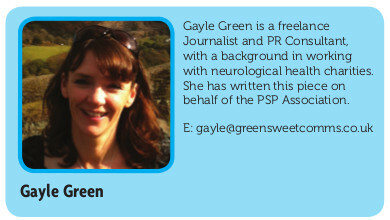 To learn more about PSP as well as the PSP Association see www.pspassociation.org.uk or telephone 01327 322410.